A glance at my list of restaurant reviews tells me that I’ve written about 821 Cafe three previous times–in October 2009 and March & July of 2010. My goodness gracious, I guess I like this place a lot? But a trip to Richmond is no trip at all without some 821 brunchy goodness, so this year it was a must (especially since I didn’t make it in October 2010 due to some rushed circumstances). G & I ended up eating at 821 twice this trip–which is strange because we normally try to not eat at the same places over and over again. But after our first brunch, he loved it so much that he wanted to go back, and who am I to deny such deliciousness? The first meal was on Saturday around 11ish am and while G ordered an omelette special, I opted for the vegan special of tofu rancheros. 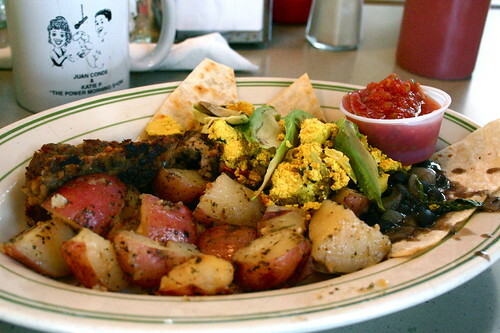 Tofu scramble, black beans, salsa, avocado, tortillas, and sides of vegan sausage and herbed potatoes? Yes please! While the tofu was wonderful, per usual, the main draw for me is the vegan sausage–there’s something in the TVP-wheat gluten combo that is oh-so-perfect and a little meaty, even G thought so. And the potatoes? 821’s are some of the best I’ve had–tons of herbs, salt & pepper cooked to perfection. Be still my heart. Our second brunch was on Sunday, but a bit later, closer to noon by the time we got a table, and I wasn’t feeling breakfasty at that point. G’s gravy & biscuits were great, but I was jonesing for something different and ordered the utterly irresistable looking tofo po’boy. Hot damn and high heavens, that po’boy is radtastique! G even mentioned that it was better than most meaty po’boys he’s had in New Orleans. I’ve never had a non-vegan one, but this one took the cake for a po’boy I didn’t have to make. I have no idea what’s going on with the tofu (notice the specks in it? Nori? Pepper? I’m not sure…), but it’s fried and crispy, and to die for, and with veganaise, peppers, onions, tomato, and lettuce (and a splash of hot sauce), you can’t beat it. As for the side of vegan chili, it was good, but I was so stuffed from the sandwich that I never got around to eating more than a bite or two. I’m obviously a huge fan of Cafe 821 (even though their newish space is so clean and sparkly and the crowds are a little more genteel than the original ones), but this past week made me fall in love even more. Plus G absolutely loved it! 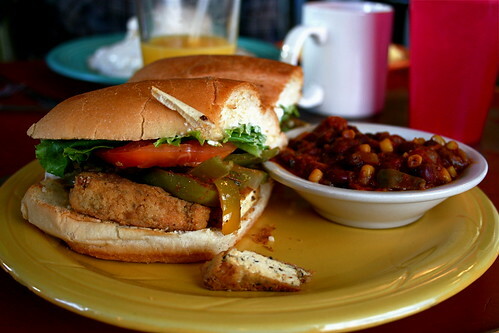 If you’re in Richmond, definitely check it out for some of the best vegan eats in the city, and if you’re there at brunch be sure to get that vegan sausage, you won’t regret it! Twin Oaks? No, I’ve never heard of it–going to look it up right now!!! It was so so so tasty! Wow, great choices for vegan brunch food! Usually at restaurants, I’m stuck with the typical tofu scramble and toast. Love that po’ boy! Well, who could resist a massive amount of delicious brunch? Not me, certainly. If I am ever in Richmond I will definitely have to check this one out! oh man, i haven’t had their po’ boy in forevs, Jes! i need to make an xgfx version, stat! the tofu itself is Twin Oaks’ herbed tofu (i’ll bet a bahbillion buckaroos on it!) – that’s all the herby goodness inside the tofu there. i wanna say Twin Oaks now makes 2 types of herbed tofu and their plain tofu, hell – i eat it raw sometimes – it’s that goooood. i bet that’s their sausage, too. i remember it from back in the glutenous days. it was THE BEST! next time you’re in rva go to Ellwood Thompsons – they carry Twin Oaks tofu (and some WFs do, too – i believe) AND their vegan sausage. mmmmmmmm! Awesome! I’m so going to have to find some stat–that tofu is the jam! A xgfx version would be rockin’, go do it!